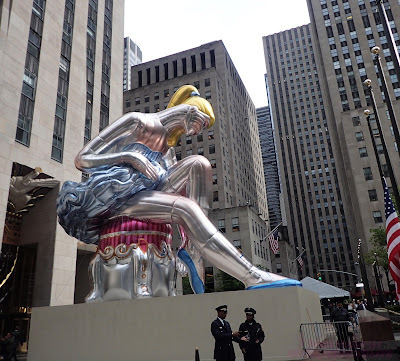 Big Apple Secrets: Seated Ballerina by Jeff Koons, Rockefeller Center. Is it a plagiarism? Seated Ballerina by Jeff Koons, Rockefeller Center. Is it a plagiarism? Seated Ballerina by Jeff Koons, a large-scale public art installation is on display at Rockefeller Center from May 12 - June 2, 2017. Jeff Koons is widely regarded as one of the most important, influential, popular, and controversial artists of the postwar era. 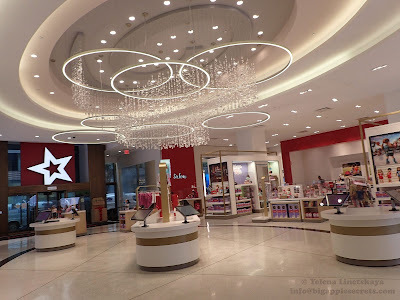 He was born in 1955 in York, Pennsylvania and received his B.F.A. at the Maryland Institute College of Art in Baltimore. Since his emergence in the 1980s, Jeff Koons has blended the concerns and methods of Pop, Conceptual, and appropriation art with craft-making and popular culture. In 2007 Jeff Koons contributed to the Macy’s Thanksgiving Day Parade with the silver Mylar Rabbit, a version of a 1986 work originally rendered in metal. The new piece is Koons’s third project at Rockefeller Center. 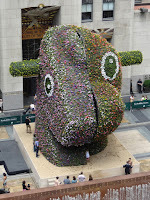 The first one was a giant Puppy installed in 2000. Puppy, rising 43 feet , was formed from a series of stainless steel armatures constructed to hold over 25 tons of soil watered by an internal irrigation system. Over 70,000 multi-hued flowering plants grow from this steel and soil structure, including marigolds, begonias, impatiens, petunias, and lobelias. 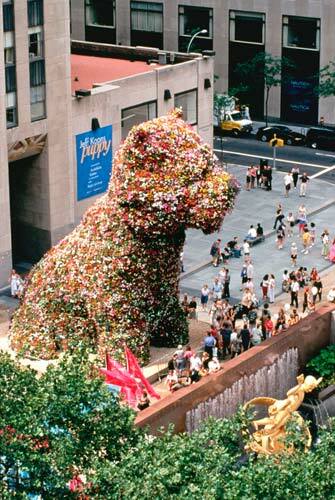 Puppy was a symbol, according to Koons, of "love, warmth and happiness". 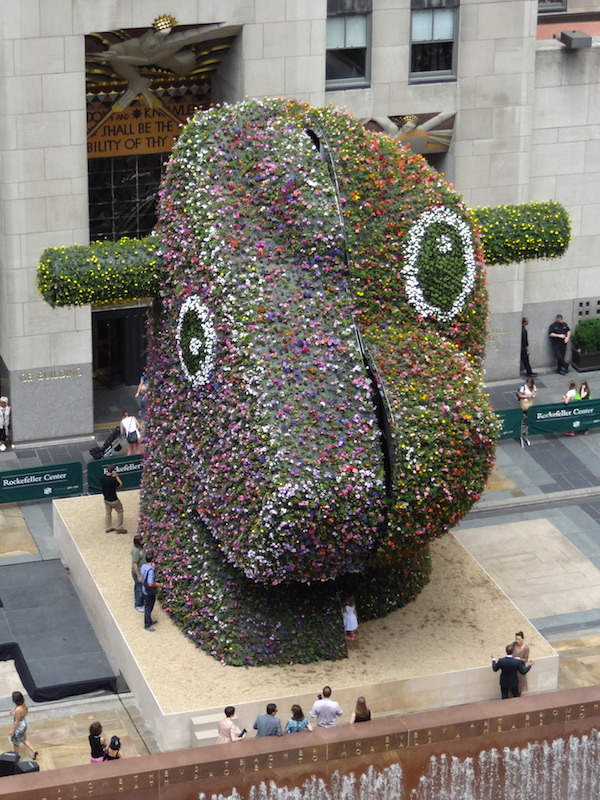 Koons's Split-Rocker, 37 feet high featuring over 50,000 flowering plants, was installed on the same place in Rockefeller center in 2014. The Ballerina, inflatable nylon sculpture, stands 45 feet high and depicts a seated ballerina from the artist’s iconic Antiquity series. Koons has already created two versions of the Ballerina, one just a foot-and-half tall made from hand-painted wood and the other seven feet tall and made from the artist’s signature mirror-polished stainless steel with colored coating. The large Ballerina appeared in 2016 at the Museo de Arte Latinoamericano de Buenos Aires (MALBA) in Buenos Aires. 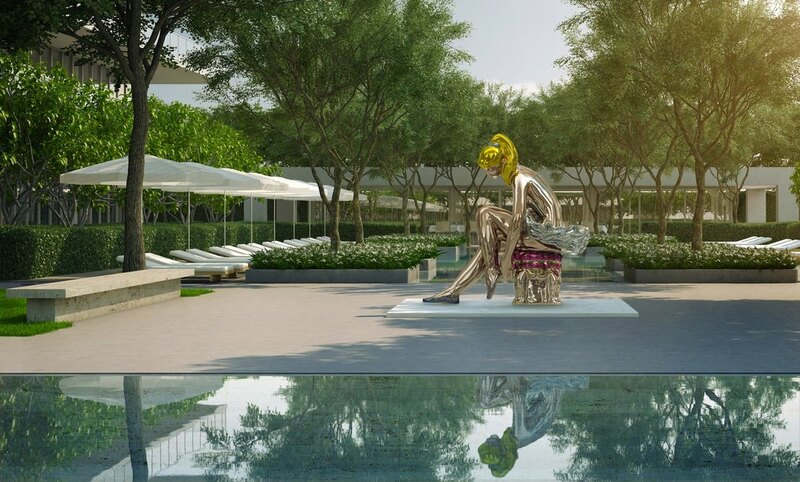 The museum’s founder, Eduardo Costantini, purchased the piece and later installed it at Oceana Bal Harbour condominiums in Miami. The Ballerina is inspired by a turn-of-the-century porcelain ballerina figurine found in a Russian factory. 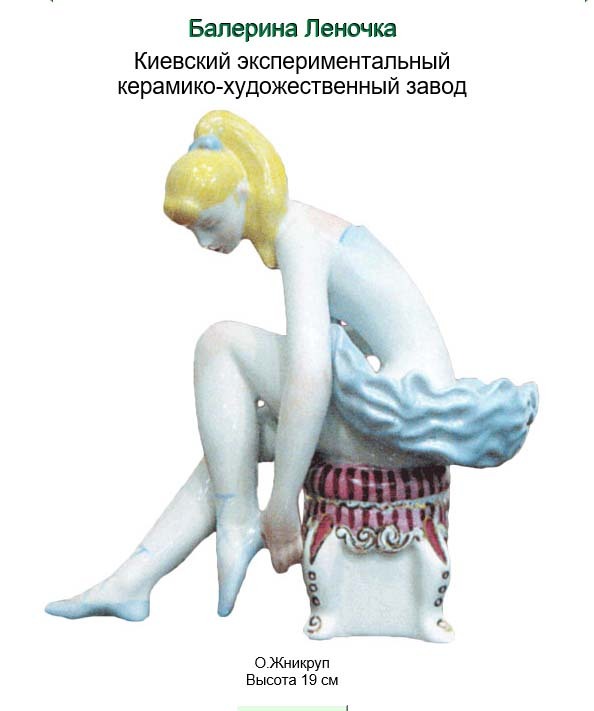 Several days ago Several days ago a magazine Art Dependence published an article with the title "Is Jeff Koons ‘Seated Ballerina’ A Copy of This Ukrainian Sculpture?" The article mentioned that inflatable ballerina and the small wooden version of the statue "feature a blond-haired ballerina in a blue tutu dress sitting on a pink stall and reaching to adjust her blue ballet shoes – details which bear a striking resemblance to the 19cm porcelain model created by Zhnikrup. Oksana Zhnikrup was a Ukrainian sculptor and painter and a member of the Union of Artists of Ukraine. She works in The Kiev Experimental Ceramic-Art Factory where she created a number of works, many of them featuring female characters and including ‘Balerina Lenochka'. She passed away in 1993. Her works have appeared at the Republican Exhibitions of Decorative Art and in international exhibitions in Chicago, Zagreb, Turkey and Canada. So the question now is can ballerina sculpture be a plagiarism of the porcelain figurine of the Ukrainian masters?